My dieting and diet plans don’t really revolve around changing my diets as much as changing my habits. Rather than going on really strict diets, I have found that altering how I live my life and eat my meals into habits that I can actually stick to, I have found that I can live a normal life while looking great too. And that’s really what we are all after anyways isn’t it? One of the ways that I do this is by eating mostly salads for my dinner meals throughout the week. 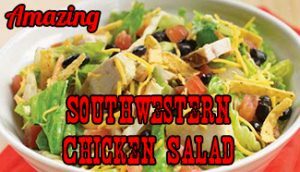 A favorite salad recipe of mine is the super amazing southwestern chicken salad. *These quantities should allow you to feed two people. Again, another reason why I enjoy having salads for dinner is that they are so easy to make. Most of them take 10 minutes to make, which is great if you’re really busy. Either BBQ or pan fry the chicken until it is fully cooked. I like to season the chicken with a bit of salt and pepper and chipotle powder. It gives it a nice flavor to it. To make the dressing, mix in the lime juice, olive oil, minced garlic, cilantro, salt, cumin and chipotle powder. Wash and chop all your greans then grate your cheese over top of it. Then add some corn and beans ontop of the cheese. Put some of the chicken ontop of the corn and beans and add some salsa and some of the lime dressing. Finish it off by adding some avocado slices and cilantro to the top of the salad and enjoy! Remember, with salads like these you can always add or subtract ingredients. For example, you could even make it without the dressing if you didn’t have the ingredients. Mix it up, experiment and have some fun while achieving your weight loss goals.